There is no monthly meeting scheduled for May! 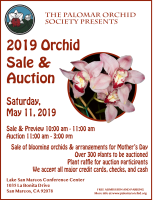 The Palomar Orchid Society will host its 2019 Annual Orchid Sale and Auction on May 11, 2019 at the Lake San Marcos Conference Center (1035 La Bonita Dr., San Marcos, CA 92078). The event begins at 10 am with a preview of auction plants and the sale of blooming orchids and arrangements for Mother's Day. At 11 am, the auction will begin, which includes over 300 plants including many in bloom. The event is open to the public and free to attend. For sale items and auction winnings all major credit cards, as well as check and cash are accepted. As in previous years, several local and Hawaiian vendors will be providing plants including Kalapana Tropicals (Hawaii), Andy’s Orchids, Cal Orchid, Casa de las Orchideas, Rudvalis Orchids, Sunset Valley Orchids, as well as other local growers and plants from our members. In addition to plants, we will have some orchid books and magazines for sale at bargain prices. There also will be a small plant raffle at no cost to the auction participants. The auction is our only fundraising activity of the year and proceeds will fund our educational speaker program and other society activities. This is a fantastic opportunity to add some new orchids to your collection at very reasonable prices and have some fun doing it. We look forward to seeing you on May 11, 2019! The Palomar Orchid Society generally meets at 6:30 pm the FIRST WEDNESDAY of every month at the Lake San Marcos Conference Center (1035 La Bonita Drive, San Marcos, CA 92078). Traveling on State Route 78, take the Rancho Santa Fe exit and head South. The entrance to the Lake San Marcos Resort is about a mile South of the San Marcos Blvd. intersection. Traveling on I5 South from Oceanside and North Carlsbad, take the Palomar Airport exit and turn right onto Rancho Santa Fe. Traveling North on I5 from South Carlsbad and Encinitas, for example, take the La Costa Ave. exit and turn left onto Rancho Santa Fe. The entrance to the resort will be the first right after the fire station in San Marcos.